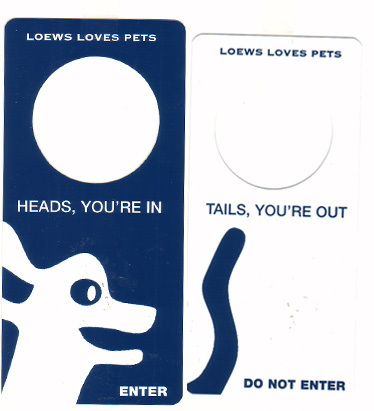 In the early twentieth century, hotel do not disturb signs were available in only the finest luxury establishments. Today, they’re ubiquitous. 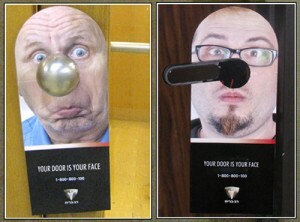 Modern hotel door hangers can be as much about form as they are about function. 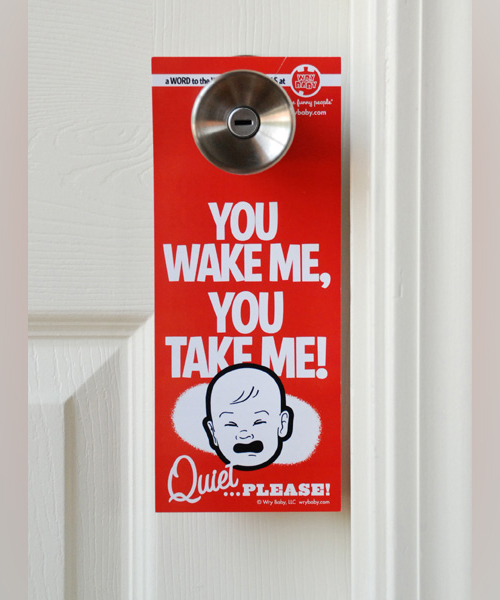 Here are nine hotel do not disturb signs that get high marks for originality and creativity. 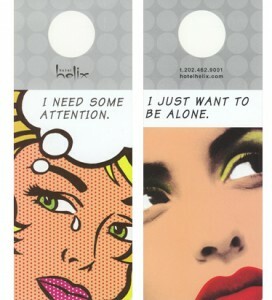 The Hotel Helix is a boutique property in Washington, DC, with rooms as uniquely individual as their door hangers. 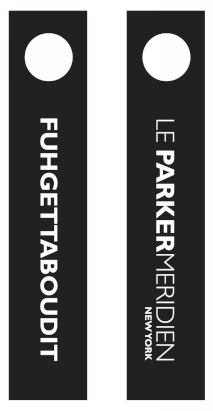 New York’s Le Parker Meridien is not too sophisticated to garner a little street cred with the quintessentially New York tough-guy phrase: FUHGETTABOUDIT! These die cut signs for the Westwood Hotel feature a wood-grain finish. Known as “Surf City USA,” Huntington Beach is home to the Hilton Waterfront Beach Resort and its surfboard-themed door hangers. 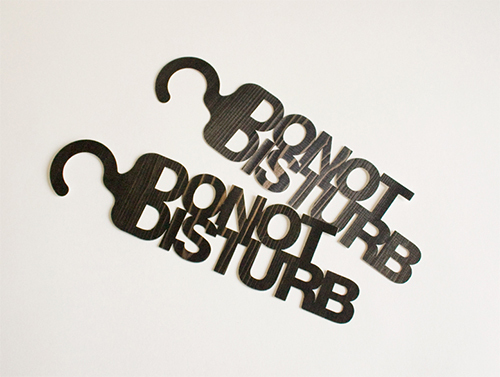 These typography inspired door hangers were created by Elaine Li. 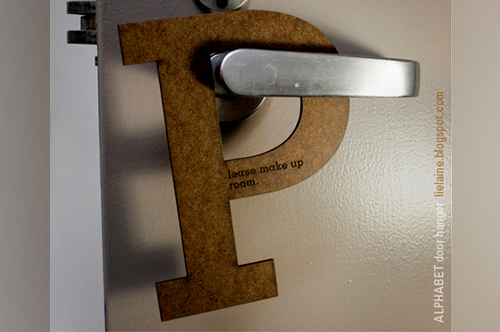 The P shape begins the phrase “please make up my room” printed on the sign’s face. As the sign says: “Loews loves pets.” They would also love to keep your pet from surprising unsuspecting staff. Iconic Bay Area imagery is mixed with dot com lingo at San Francisco’s Stanford Court. 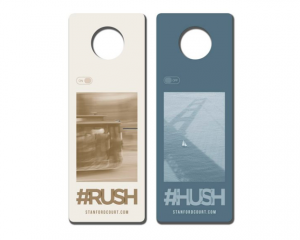 #RUSH for service, #HUSH for DND. If baby’s not happy, nobody’s happy. 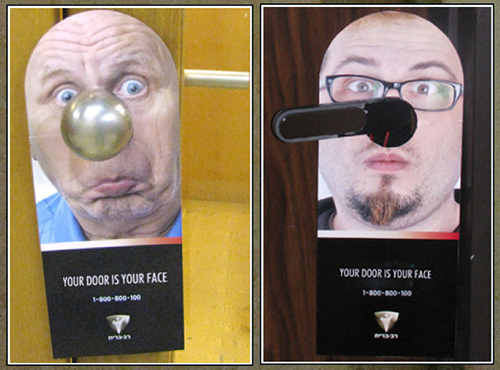 Though technically not for hotel use, this door hanger campaign designed by Saatchi & Saatchi for Israeli door manufacturer Baumann Ber Rivnay earns a mention for creativity and humor. If you’re looking to create your own do not disturb signs, consider using plastic. 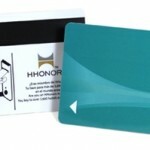 Plastic door hangers and key lock inserts are durable, vibrant and affordable.